"This is a family favorite! A simple DIY that everyone will love! This is a family recipe from my Grandma, Penny Faust. 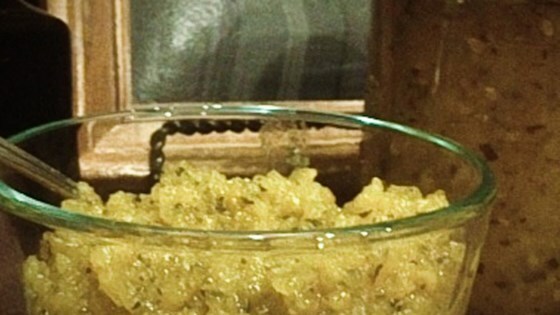 One of my favorite childhood memories was watching my mom can her sweet zucchini relish. Yum! We use it in anything from homemade dressings, potato salad, egg salad, tuna salad...etc." Run zucchini, red bell pepper, and onions through a meat grinder. Transfer ground zucchini mixture to a large bowl; sprinkle with salt. Refrigerate zucchini mixture, overnight or at least 10 hours. Pour zucchini mixture into a large pot; add sugar, vinegar, celery seed, and turmeric. Bring to a boil, stirring constantly, for 15 to 20 minutes. Stir cornstarch into mixture; continue boiling until thickened, about 5 more minutes. Sterilize the jars and lids in boiling water for at least 5 minutes. Pack relish into the hot, sterilized jars, filling the jars to within 1/4 inch of the top. Run a knife or a thin spatula around the insides of the jars after they have been filled to remove any air bubbles. Wipe the rims of the jars with a moist paper towel to remove any food residue. Top with lids, and screw on rings. Discover the secret that makes these crabless cakes taste like the real deal.